The national symbol has four chambers,like the heart. Count the seeds and see if there's one for every day of the year. This season of the year, when the fruit trees have already bloomed, nature has another surprise in store for visitors in Armenian gardens. Pomegranates begin blossoming in the southern and northeastern regions of Armenia. Pomegranate flowers look like tongues of flame blazing in red bowl-like cups. In late autumn the flowers ripen into beautiful fruits. 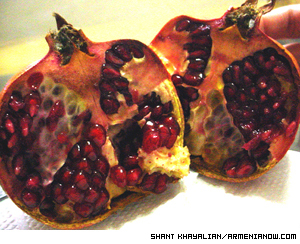 The pomegranate, a fiery and beautiful fruit, also symbolizes Armenia and Armenian people. People used to worship the pomegranate and believe in all phenomenons related to this fruit. Of course, in ancient times, the fruit was not characteristic of the entire region. It characterized Siunik and Artsakh. In addition, in Armenian mythology, the pomegranate symbolized fertility, abundance and marriage. One ancient custom widely accepted in ancient Armenia was performed at weddings. A bride was given a pomegranate fruit, which she threw against a wall, breaking it into pieces. Candidate of historical sciences Armine Stepanyan explains that scattered pomegranate seeds ensured the bride future children. She says that in Artsakh it was accepted to put fruits next to the bridal couple during the first night of marriage. The pomegranate was among those fruits, and was said to also ensure happiness. It is believed the couple enjoyed a pomegranate wine as well. "The symbol of the pomegranate is connected with insemination. It protected a woman from infertility and protected a man's virile strength," says Stepanyan. At all times the fruit has inspired artists. Gevorg Simonyan, a salesman at the Aghaksak gift shop, says souvenirs made of pomegranate are of great demand. Pomegrante items can be found in almost in all Yerevan art galleries. "The biggest clay pomegranate in our gallery costs 20,000 drams (about $35), and the smallest one is 3,000 drams. They aren't made all in the same shape. Masters made them individually, and each one is unique. All of them are different and original," says Simonyan. If you visit Yerevan's outdoor arts and crafts market on the weekend, vernissage, there is no doubt that the pomegranate is the symbolic fruit in the life of Armenian people. You will see a parade of pomegranates. Pomegranates are the Armenian symbol of life. Tradition holds that each mature pomegranate has 365 seeds, equal to the days in a year. The cultivation of the pomegranate has a long history in Armenia. Decayed pomegranates, discovered at the historic spot "Karmir blur" (red hill), have a history of 3000 years.